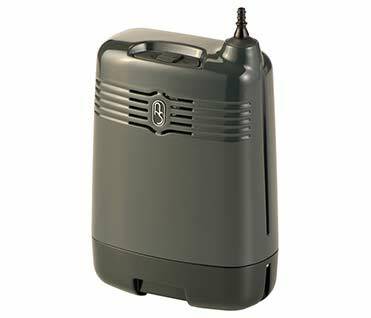 The lightest Portable Oxygen Concentrator available today is the AirSep Focus weighing 1.75 lbs. This small unit delivers a pulse or on demand delivery the equivalence of 2 Liters per Minute of oxygen. This is not a continuous flow. This is, however the least weight solution for portable oxygen needs. It only delivers oxygen at a setting of 2, the most commonly prescribed level of oxygen flow. The AirSep Focus Portable Oxygen Concentrator uses battery power for portability needs. The battery lasts 1.5 hrs. A great way to extend your battery range is to use the AirSep Battery AirBelt that was designed to be used with AirSep’s previous model the FreeStyle. Using the AirBelt, 4 hrs of battery time can be achieved. This unit comes with a DC car adapter and an AC Wall power supply. This is a small solution to portable oxygen needs. In conjunction with the Battery Airbelt, using this machine on plane rides is one more option to give people more choices with traveling with oxygen. The AirSep Focus Portable Oxygen Concentrator is FAA Approved. Advanced Aeromedical offers short term rentals and sales of the AirSep Portable Oxygen Concentrator, call us at 800-346-3556 for more information.